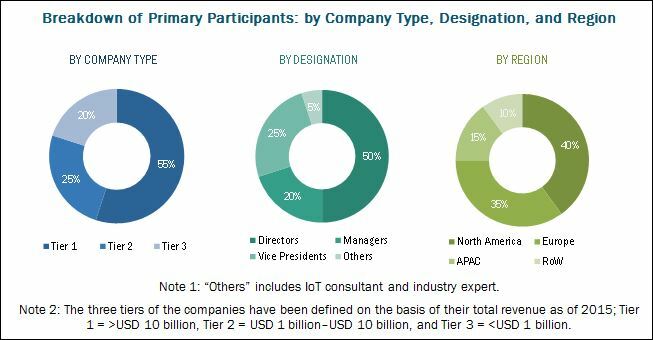 [262 Pages Report] The IoT node and gateway market constitute of hardware such as processor, connectivity integrated circuit (IC), sensor, memory device, and logic device, which are used in Internet of Things (IoT)-enabled devices. In terms of volume, the market is projected to reach 17.18 Billion units by 2023, growing at a CAGR of 30.9% during the forecast period. The base year used for this study is 2016 and the forecast period is from 2017 to 2023. This report provides a detailed analysis of the IoT node and gateway market on the basis of hardware, end-use application, and geography. To estimate the size of the IoT node and gateway market, top-down and bottom-up approaches have been followed in the study. This entire research methodology includes the study of annual and financial reports of top players, presentations, press releases; association/consortium such as Semiconductor Industry Association (SIA), IoT Acceleration Consortium (Japan), and European Research Cluster on the Internet of Things (IERC); paid databases such as Google Finance, Factiva (By Dow Jones & Company), Yahoo Finance; and interviews with industry experts. Moreover, the product shipment for each end-use application is used to arrive at the shipment units of the overall IoT node and gateway market. This overall market size, in terms of volume, was used in the top-down procedure to estimate the size of the other individual markets through percentage splits from secondary and primary research. The IoT node and gateway market comprises players such as Intel Corporation (US), NXP Semiconductor N.V. (Netherlands), Texas Instruments Incorporated (US), Cisco Systems Inc. (US), and Hewlett Packard Enterprise Co. (US). “The study answers several questions for stakeholders, primarily which market segments to focus on in the next two to five years (depends on the range of the forecast period) for prioritizing the efforts and investments”. 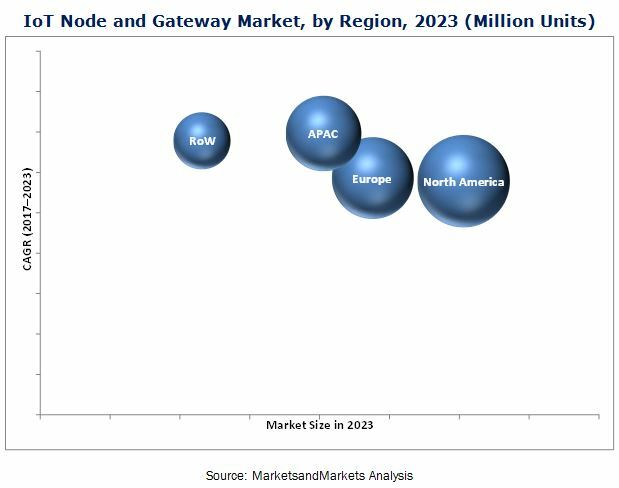 The IoT node and gateway market stood at 2.83 Billion units in 2016 and is expected to reach 17.18 Billion units by 2023, growing at a CAGR of 30.9% during the forecast period. The major drivers for the growth of the market is the increasing demand for application-specific microcontroller units (MCUs) and flexible System on Chip (SoC)-type designs, improved internet connectivity in technologically advancing countries, and increased IP address space and security solutions provided in IPv6. Of all the major end-use applications, retail held the largest share of the IoT node and gateway market in 2016, in terms of volume. The growth of retail end-use application was primarily due to the increasing adoption of IoT-enabled products such as contactless checkout/PoS, digital signage, and smart tags. The BFSI end-use application is expected to grow at the highest CAGR in the IoT node and gateway market from 2017 to 2023, followed by aerospace and defense. Banks are trying to create intelligent and personalized customer cross-selling opportunities. The mass adoption of online banking, contactless payment, and mobile banking apps has increased significantly, thereby driving the growth of the market for BFSI end-use application. On the basis of hardware, the IoT node and gateway market has been segmented into processor, connectivity IC, sensor, memory device, and logic device. The connectivity IC held the major market share in 2016 and is expected to retain its position till 2023. The significant recent development of IoT- enabled products is one of the key factors leading to the dominance of this segment. Of all the regions, North America held the largest share of the IoT node and gateway market in 2016, in terms of volume. An established IT ecosystem and early adoption of various IoT-enabled products across multiple end-use applications are the most prominent factors behind the growth of this region. The market in Asia Pacific (APAC) is expected to grow at the highest CAGR from 2017 to 2023 because of the high consumer base, increasing disposable income, and improving IT infrastructure, as well as the growing penetration of the internet in commercial and residential spaces. One of the key restraining factors for the IoT node and gateway market is the privacy and security of data. As there are a large number of sensors that monitor the data, the companies and organizations have more control over this data. These companies can take advantage of the data to automatically determine one’s car insurance, evaluate health status, track behavior of a company’s strategies, and so on. To solve this IoT security concern, companies such as Cisco Systems (US) and Intel Security Group (US) are taking the necessary steps. However, in spite of the development of more secure hardware products and software solutions, systems and solutions continue to be prone to cyber threats. The data security concern would continue to prevail and is expected to affect the demand for hardware for IoT applications leading to the need for the development of more secured and highly encrypted chipsets and connectivity solutions (such as gateways) in the future. The companies that are profiled in the report are Intel Corporation (US), Huawei Investment & Holding Co., Ltd. (China), NXP Semiconductor N.V. (Netherlands), Texas Instruments Inc. (US), Cisco Systems Inc. (US), Hewlett Packard Enterprise Co. (US), TE Connectivity Ltd. (Switzerland), STMicroelectronics N.V. (Switzerland), Advantech Co., Ltd. (Taiwan), Dell Inc. (US), Eurotech S.P.A (Italy), AAEON Technology Inc. (Taiwan), Adlink Technology Inc. (Taiwan), NEXCOM International Co. Ltd. (Taiwan), Microchip Technology Inc. (US), Notion (US), Helium System Inc. (US), Samsara Networks Inc. (US), Estimote Inc. (US), and Beep Inc. (US). 11.3 Huawei Investment & Holding Co., Ltd.
11.7 Hewlett Packard Enterprise Co.
11.17.2 Nexcom International Co., Ltd.